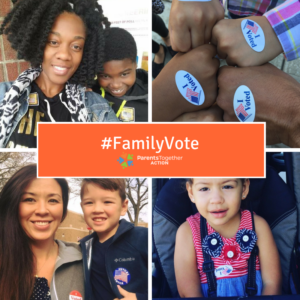 Parents: Power Up the #FamilyVote! This election, critical issues for families are up for grabs. But if we want to be heard, we need to show up. And there’s one easy step we can take to to flex our political power and change the culture of voting. Take Your Kids to Vote! Voting is one of the most important things we can do to create the world we want for our children and — bonus! — parents who involve kids in elections raise civic leaders! So this November, when you vote — at the polls or by mail — do it with your kids. 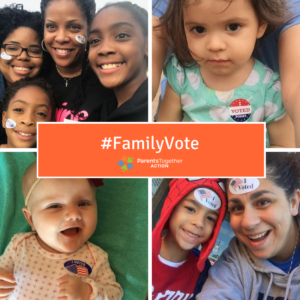 Then inspire a flood of other parents to vote with a #FamilyVote selfie. Early voting and mail ballots count, too! Take an action shot when you put it in the mail. Step 2: Share & Inspire Others! Involving kids in voting teaches them a real-life lesson in democracy, and it helps show our country that families matter and have a powerful voice. 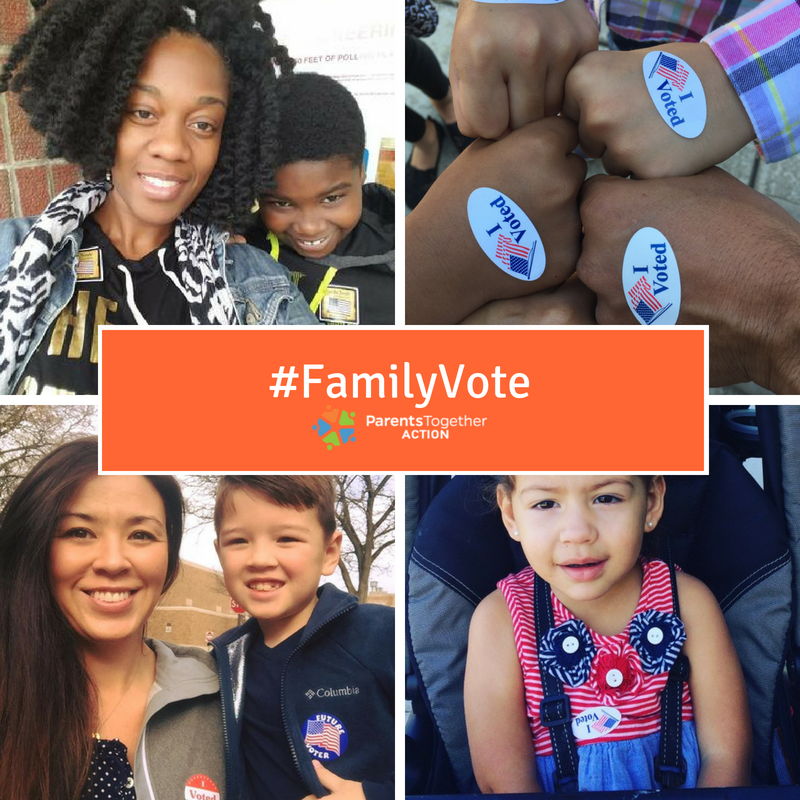 Share this on Facebook to tell your friends you’ll be sharing a #familyvote photo when you vote. Or, save one of our pics and post to Instagram. Follow us on Facebook, Twitter, and Instagram to see more coming in from all across the country! 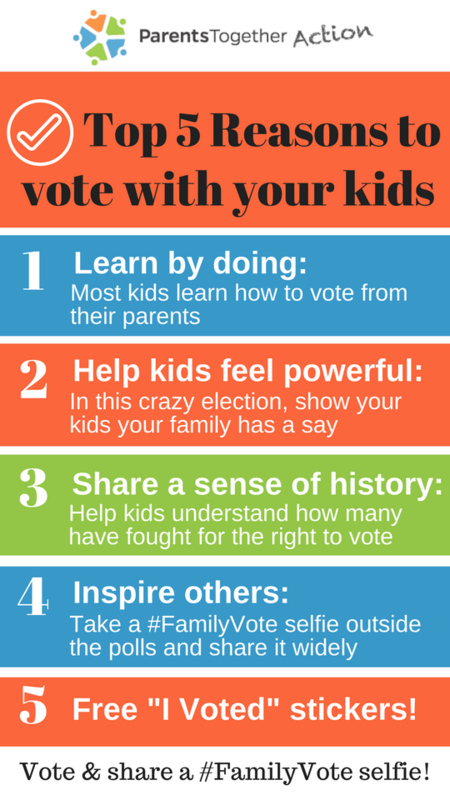 Check out our Top 5 Reasons to Vote with Your Kids. Want to show your little one what it’s like at the polls? Check out this quick PBS video. Whether or not you can take your kids to the polls, our friends at MomsRising have a great downloadable guide to celebrate voting with your kids. Questions 4 Kids: Ask your kids a creative Q4KIDZ question every day to spark meaningful conversions. Raising Bilingual Kids: Raising bilingual kids who speak Spanish and English? Get activities, advice, and reminders. Simple Parenting: How much sleep do kids really need? Sign up for parenting tips. Action Alerts for Parents: Together, we can work towards better outcomes for kids and families across the country. Sign up for updates and action alerts, specifically for parents. Help Get Out the Vote! Remind your friends to vote today! It’s quick and effective with Messenger.